BEIRUT – Despite terrorist warnings that all Christians in the Middle East are “legitimate targets,” the faithful in the region say they have placed their trust in God. An al-Qaida group in Iraq made the threat in an Internet statement in early November. The same group was responsible for the Oct. 31 siege in the Syrian Catholic cathedral in Baghdad that ended in a rescue drama that killed 58 people, including 46 Catholics who were in the church. While the Christian presence in Lebanon – about 33 percent of the population – has been steadily dwindling due to emigration, Barbara said she is determined to stay in the land of her birth. Fahed said that, growing up in Beirut, he experienced the horrors of the 1975-1990 civil war. “We had bombs and shells exploding in our house, yet God kept me and my family safe from danger,” he said. During the Israel-Hezbollah war in the summer of 2006, he continued with his daily routine, going to work every day. Jocelyn Cherfan, 45, a Maronite Catholic from Beirut, said, “Without Christians, Lebanon would not be Lebanon,” pointing out that the country would become like another Saudi Arabia without its Christian presence. “We are all living together here – Muslims and Christians,” she said, noting that many Christians are married to Muslims. 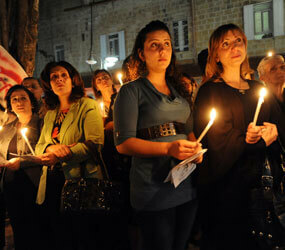 Cherfan views the persecution of Christians in the region as a “wake-up call” for the faith. Christians in Jordan – representing only about 3 percent of the country’s population – are also expressing trust in the Lord. In the West Bank, although Christians are a target for extremists, they are not afraid, said Father Faysal Hijazen, priest at Holy Family Parish in Ramallah. Anton Habash, 63, sat inside Holy Family before a special Mass honoring the Iraqi massacre victims. As she guided her 10-year-old daughter, Carmen, into the church, Abir Kidess, 35, said she would never be intimidated from practicing her faith or leaving her homeland. “I am proud of being Christian and I am willing to die for my faith if that is God’s plan,” she said. She said she had spoken to her daughter about the attack and what had happened. “I am afraid they will come to kill us like they did at the Iraqi church,” said Carmen, adding that only her faith in God made her feel safe. “This is not possible for all of them, but it’s the only way to find inner peace and so to resist in a very hostile context,” he said.